Published: Dec. 30, 2013 at 09:01 a.m. Updated: Dec. 30, 2013 at 04:26 p.m.
One season after leading the Minnesota Vikings to the playoffs, Leslie Frazier is out of a job. The team announced Monday that Frazier had been fired. The Vikings went 4-3-1 in their final eight games, but it wasn't enough. Frazier finishes 21-32-1 in three-plus seasons as Vikings coach, including a 3-13 mark in 2011, his first full season as head coach. He took over as interim coach for Brad Childress midway through the 2010 season. Frazier's tenure was marked by an inability to develop a quarterback. This season, he struggled just to choose between Christian Ponder, Matt Cassel and Josh Freeman. Even more damning: Frazier's defense badly declined in 2013, giving up more points than any team in football. 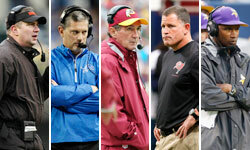 NFL Media Insider Ian Rapoport reported that the team already has been doing background work on candidates for some weeks, according to a team source, and might target a hot young assistant. Rapoport reports the Vikings have inquired about Broncos offensive coordinator Adam Gase. Every NFL job is attractive, but the Vikings will have bigger challenges than most other openings this offseason. The team doesn't have a solution at quarterback; Cassel is expected to be brought back for 2014. Outside of Adrian Peterson and Cordarrelle Patterson, the roster is uninspiring overall. Left tackle Matt Kalil had a rough second season. Defensive end Jared Allen is a free agent and is expected to leave town. The linebacker group and secondary have holes everywhere. Minnesota will play in a college stadium the next two seasons before moving into their permanent new home in 2016. The Vikings also are stuck in a division with Aaron Rodgers. Until they find a quarterback, it's going to be an uphill battle.